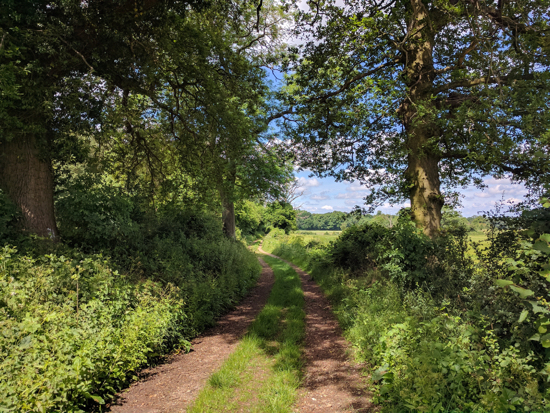 A circular walk enjoying the secluded paths and woodlands of the undulating countryside surrounding the B158 between Essendon and Wildhill. The walk passes by four local pubs, so there are several options for refreshments. It can be muddy in places after rain. 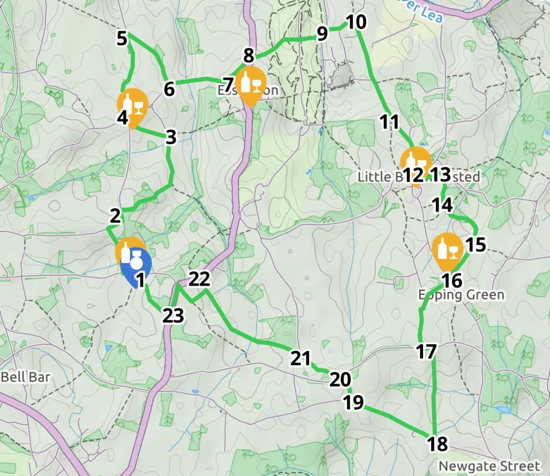 The walk can be started at any point along the way, although our directions start and finish at The Woodman, Wildhill where you can park if you are intending to visit the pub at the end of the walk. Above is an image of the map of the route. A larger version of the map - which can be expanded to see more detail - is embedded at the end of the walk. Throughout the directions below I have referred to the official Hertfordshire County Council (HCC) numbers for the footpaths. This is the first time I have done this. 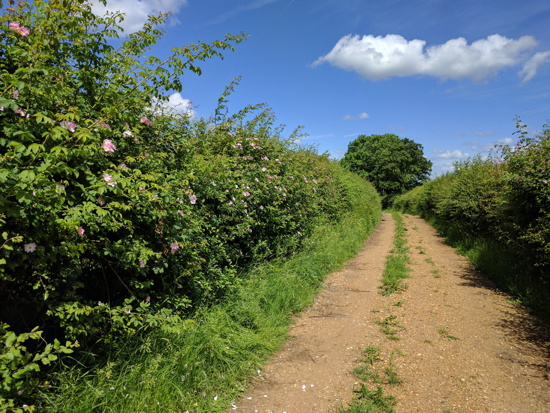 A map with all the footpaths, byways, and bridleways in the county can be found on the HCC site. I have added them here in case anyone wants to double check. Many footpath, bridleway, and byway signs have the numbers on them, although some of the older ones don't. 1: Leave The Woodman car park and turn left on Wildhill Road until you meet West End Lane where you turn right and head north along this quiet country lane as it first dips down and then climbs to a right-hand bend. Continue round to your right following the lane as it then turns left and continues to head north. Look out for a footpath sign on your right heading into the woods. This is a BOAT (Byway Open to All Traffic) and is route 14 to Essendon. 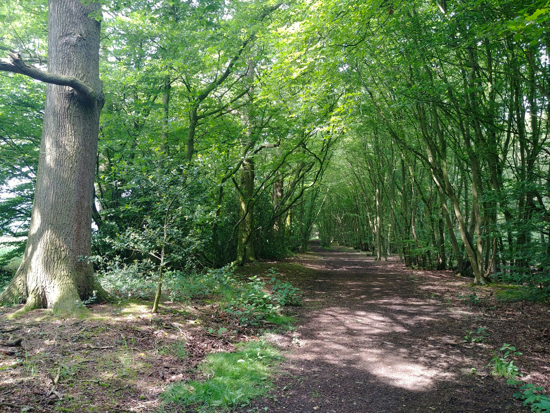 2: Take this path and continue through Home Wood and Harefield Wood. At first you will be heading north-east. After half a mile you will see footpath 16 going off to your right. Ignore it and continue along byway 14 as it heads north, dipping and climbing up to a footpath on your left just opposite a white-topped footpath marker post. This is footpath 13. 3: Turn left here and follow the footpath north-west along the edge of the field until it emerges at The Candlestick on West End Lane. 4: At The Candlestick turn right on West End Lane for a short distance as it heads north and then north-east. Just before the houses on your left you will see a bridleway sign. This is path 10. Take this path and head north. 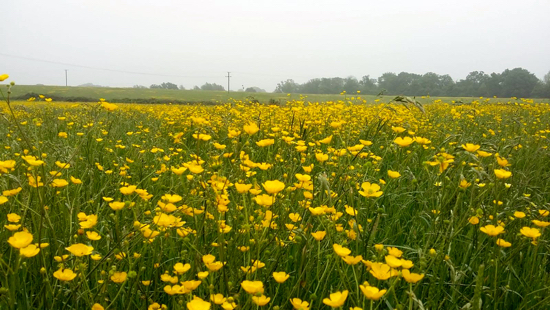 A great time to do this walk is in late May and June when the hedgerow along this route is rich in wild rose. Continue down this path for half a mile as it continues north and until you reach a footpath through the hedgerow on your right. This is path 8. 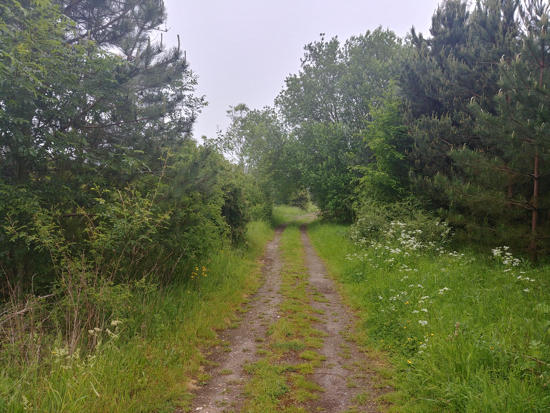 5: Take this path as heads south-east across fields, past Larkinshill Grove. At the end of Larkinshill Grove head straight following a path cut through the crop before emerging on West End Lane. 6: Here you turn left and follow West End Lane uphill towards Essendon. When you reach the outskirts of the village, look out for a footpath on your left before the first house on the left. This is path 5. 7: Take this path and head north-east over the fields to Essendon Hill. 8: Cross the road (Essendon Hill) and take the footpath immediately opposite - still path 5 - heading across Essendon golf course. When you leave the woodland and face the open golf course you will see two conifer trees straight ahead with a path running through them. This is your route. Soon after you will reach another footpath heading east across the golf course emerging on a footbridge leading to Bedwell Avenue. This is path 2. 9: Here you turn left for a short distance walking north until you reach a footpath on your right. This is footpath 1. Take this path as it continues east heading uphill to a quiet country lane in Howe Green. Turn left and follow the lane round as it turns to the right. Look out for a footpath on your right soon after a house on your right where the road bends to the left. This is footpath 4. 10: Take this path as it heads south. At first you will have a large house on your right and fields on your left before you cross open fields. You emerge at the end of a quiet lane. Here you continue heading straight (south) down a bridleway with Ashfield Farm on your right. This is path 19. Continue until you reach a small footbridge. 11: Immediately after the footbridge take the left-hand fork and climb the hill heading south-east until you reach Breach Lane. Turn right on Breach Lane and walk south until you reach Little Berkhamstead. As you reach the road, immediately opposite is the entrance to the churchyard. Take this track and, keeping the church on your right, follow the path until it reaches Church Road. Here you have the option of refreshments at the village shop or The Five Horseshoes a little futher on. 12: Immediately after leaving the churchyard on Church Road, take the footpath on your left. This is path 9. Continue along this path with fields on your right and the hedgerow on your left and follow it first north-east and then south as it swings to your right just before woodland. You are now on footpath 10. 13: Continue along the path heading south. 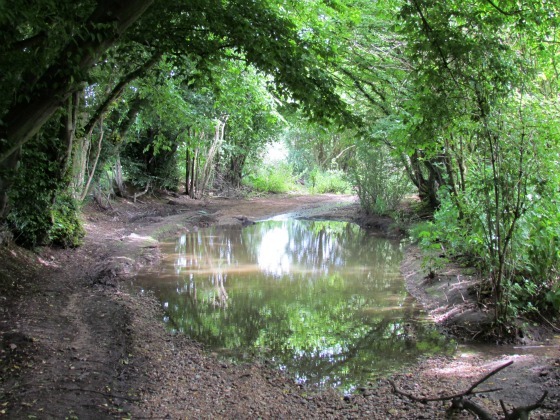 It dips, climbs, and, just as it swings to the right once more, take the left fork and dip down before crossing a small brook and climbing up to woodland. Continue until you come to the end of a small thicket on your left and where a path on your left heads downhill into Buck's Alley Woods. This is path 11. 14: Enter the woods, turn right and follow bridlepath 23 as it heads south-east, dipping and then climbing. After a wooden footbridge continue south until the path veeres to the left at the point where another footpath heads to your right. This is path 14. 16: Turn left on Epping Green and immediately look out for a bridleway sign on your right. This is bridleway 22. Take this path and head south-west along a tree-lined avenue. At the fork by a large brick wall, take the left-hand option and continue along this lane (it looks private but it's not) until it becomes a footpath heading south across fields to Tylers Causeway. This is footpath 91. 17: Turn left on Tylers Causeway (take care here because there is no footpath alongside the road) and look out for a footpath on your right. This is footpath 90. 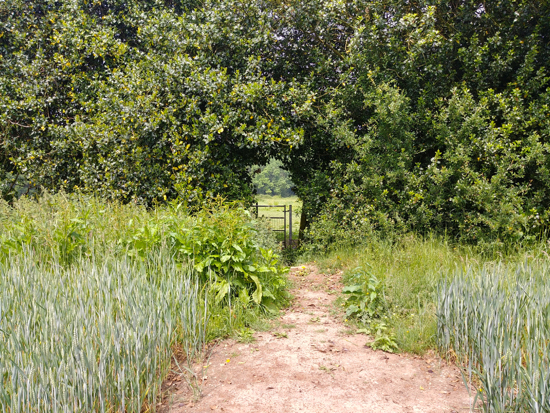 Take this path and head south with the fields on your right and the hedgerow on your left. 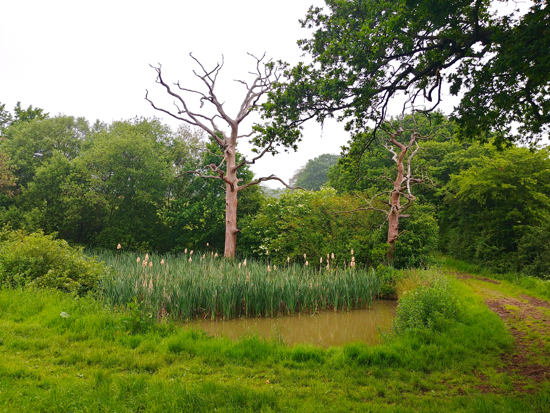 You will pass a small pond on your right before climbing up to a track at the top of the hill. This is restricted byway 88. 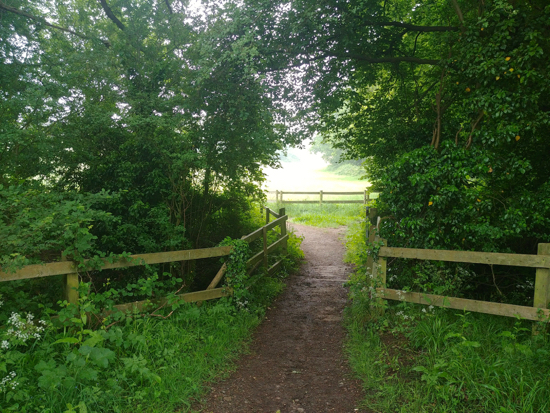 18: Turn right on the byway and head east, passing a field of horses on your right and New Park Farm on your left before the track opens up with fields on both sides and great views. 19: Eventually the byway turns to the right and heads north. Soon after you will see a path going off to your left. Ignore this and continue north until you reach Tylers Causeway. 20: Here you turn left and, immediately after Birchwood Cottages on your right take Cucumber Lane heading north-west. 21: When you reach woodland and Cucumber Lane veeres right, take the footpath on your left. 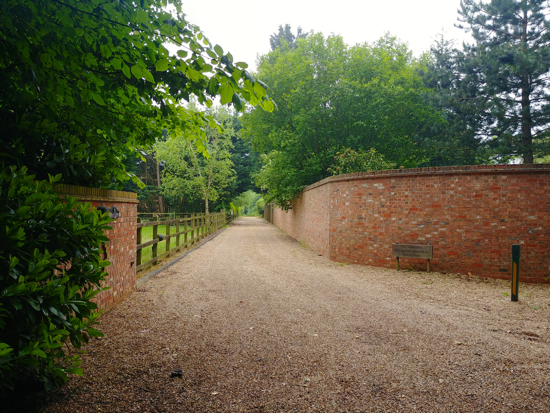 This is Hornbeam Lane, footpath 18, and is a magnificent avenue of trees through Nine Acre Wood. Continue along this footpath until you emerge on a road surfaced with paving sets. There will be a large house on your left and stables on your right. Continue along this lane until you reach the last house on your left where you will see a footpath on your left heading south-west. This is footpath 20. 22: Take the path along the side of a house, go through a gate, and continue ahead with the field on your right and the woods on your left. Eventually you reach another gate leading to a small footbridge. Here you turn right on footpath 19 until you reach the B158 at the top of Wildhill Lane. Turn left here and continue down the left-hand side of the B158 (there is a footpath) for a short distance looking out for a footpath sign on your right. This is path 85. 23: Take this path and head north-west with woodland on your right until you reach a gate. 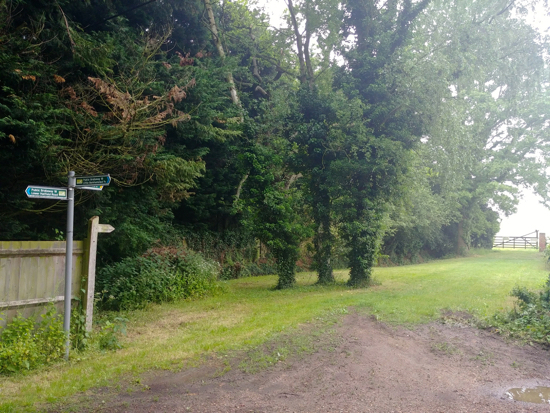 Go through the gate, cross two fields, and drop down to the car park at The Woodman, Wildhill.